It is a black hole(obviously), but this black hole is one of two, orbiting each other, and those and a yellow hypergiant, named x Car A, are orbiting each other! Since I discovered this, I want to see your discoveries. I'm excited to see what you've found! Wow. That is quite a find you've got there! My little story isn't a find. It's the story of a double planet I created, which is a bit unrealistic given how close it is to its star, and therefore how close all the objects within are to eachother. 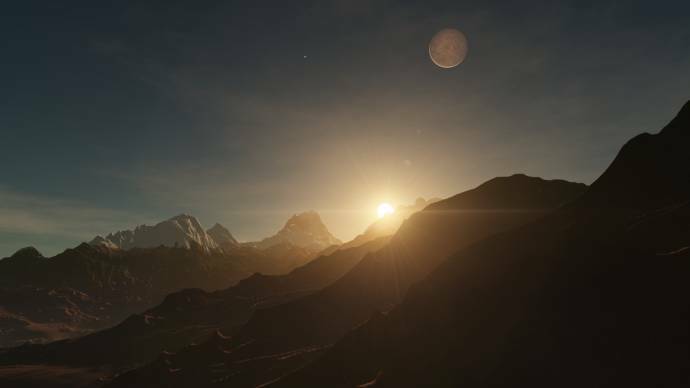 Other than that, though, it's a possible arrangement, albeit quite certainly pretty rare, but which is something you just can't find in Space Engine, at least for the time being. It does give rise to pretty awesome sights, though. You see, it's a double planet. But not just any double planet. It isn't a beefed up version of the Pluto-Charon system. True, the two main bodies revolve around a common center of mass. But they are not only much bigger than Pluto and Charon, they are also much further apart. So much so that each has its own satellites! The big one, Dostre, is a superearth, a supersized version of our little hell hole called Venus. 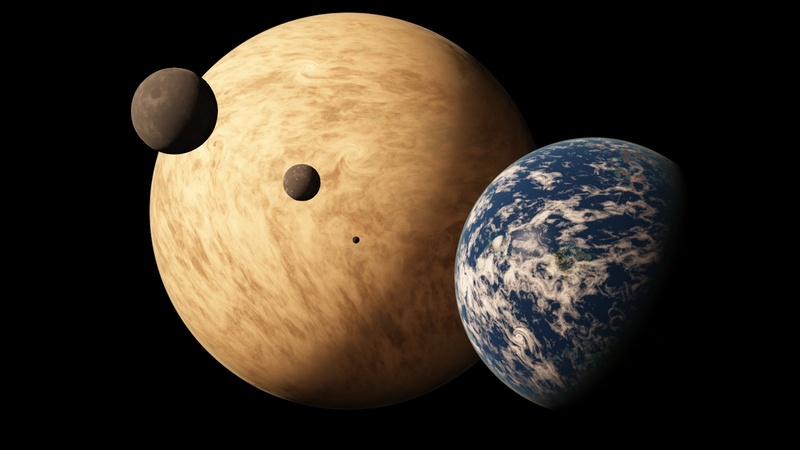 The second largest, Ratre, is the other member of the double planet pair: a Terra, a little heavier than Earth (well, it has 1.7 Earth masses), and largely covered by a global ocean, with a few small continents scattered here and there. The two selenas are satellites of Dostre, and the largest is a little less than half the size of Mars; the smallest of the five is an asteroid-sized moon, circling in a close orbit around Ratre. This last picture is a long-distance shot. It was taken from the orbit of another world, which orbits the system's sun in the L5 Lagrange point. And yes, the L4 point is also occupied by a seventh world, thanks for asking. Both are Selenas in the dwarf planet size range: it wasn't on purpose, but I just noticed that one is about the size of Pluto, the other more or less the size of Charon, which seems like a nice corollary to the whole thing. jwilman185, wait, yellow hypergiants actually generate? Because I havent found a single one up until now. Cords? Other than that, cool. I have never run into a system with two black holes yet. Only black hole + neutron star. JCandeias, very nice! What I find kind of missing in SE is the fact that moons can't generate around double planets. Also, I'll be posting my shortly. "Bored of your planet? Bored of your star? Bored of your whole galaxy? Come on down to Oasii, the lavender oasis planet! A moon of a planet of a rogue orange dwarf, Oasii has nothing in the night sky but a planet and a galaxy! That's right, Oasii, being in a rogue star system, is situated twenty thousand parsecs from the beautiful Andromeda Galaxy. Come get comfy in Oasii's thin but comfy 71 degree Fahrenheit atmosphere and wish your planet was anything like it." Yeah, I like this planet. Officially known as "RS 1186-53-8-7959162-0 A3.1".